4x4 Winch, General and Advanced Rigging. The 4x4 winch is great to have when in trouble, if regularly off roading into adventurous travels then getting stuck now and then will happen. The winch will pay for itself before you know it! Toyota Land Cruiser Stuck In Mud. Most of us actually enjoy the odd challenge of 4x4 recoveries but not many enjoy recovering a vehicle for hours on end with back breaking removal of rocks, logs and shovelling of mud. This is where the winch will do all the hard work for you, a simple pull towards an anchor point (another vehicle or a tree) is far better than spending hours digging someone else's or your own vehicle out. 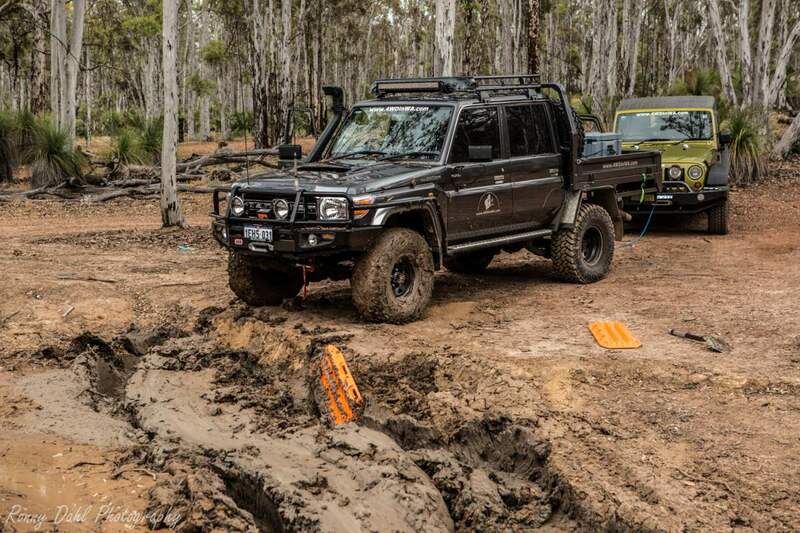 Toyota Land Cruiser Recovered With Winch. The winch is the most controlled type of recovery tool and will pay for itself once used a few times especially if off-roading often or off-roading solo. However a winch is only useful if there is somewhere to anchor the winch hook, if on the beach travelling solo a winch will do you no good unless you wish to spend a few hours burying the spare tyre under the sand as an anchor point. The winch is extremely useful in the bush, it will give you the ultimate control on a hill recovery. Slowly winching your vehicle up, winching a mate out of a bog hole or up a hill, winching down a hill if the hill is too challenging, fixing bent steering arms and also good for removing trees blocking the path. Steel cable is the original way and preferred by some, if it snaps under load a person unlucky to be in it's path could be “CUT in HALF”. It’s cheaper but heavier than rope, if it kinks it won’t straighten back to what it was and if it snaps it can’t be fixed. It is good in mud and won’t wear as fast as rope if dragged over rocks or hard ground. Synthetic Rope is light compared to steel cable and more meters/length will fit on the winch spool but very expensive. If it snaps it won’t kill anyone (could still injure a person but only minor if hit on the skin) it can also be fixed be retying/splicing it (discard the first meter of each snapped end before splicing as it will be weakened). Mud recoveries can damage the rope on a micro level as the fine dust will wear the rope, keeping the rope off the ground during recovery is recommended. The Synthetic rope would have to be the winner, it is in my book. I had cable before rope and had so many problems with it. Once I changed to rope I would never go back to cable. Choosing cable or rope may come down to money, if this is the case ask yourself what is a person’s life worth? How To Re-spool Your Electric Winch. If the rope has not been pretensioned (re spooled under load) then you risk spinning all the rope on the electric winch drum. Most people who own a winch should hopefully know how to use one, however I don't think this is necessarily the case as there is no manual which tells you what to do and what not to do, especially considering all the different situations and recovery requirements. Never use a tow ball as an anchor point, a tow ball is designed for a downward force only. A winch under load will pull it right off and send it flying damaging or possibly killing someone. Only use rated recovery gear, otherwise you will have no idea of the strength or quality of the tools used. Make sure the load rating of the recovery equipment in your winch kit is strong enough for the task at hand. You could have the strongest rated gear but just one little D shackle being under the rating required and nothing will work! Make sure there is no weak link in the chain of recovery gear when all is connected/hooked up! Make sure no one is in the exclusion/danger zone during the recovery; this includes any time the winch rope is under tension. Know the exclusion/danger zone and make sure anyone involved or watching the recovery is aware and out of harm's way. Inspect the recovery gear before using it and clean it when you return home as you would clean you 4x4. Little fine dust particles from dry mud will wear at the ropes & straps from the inside. 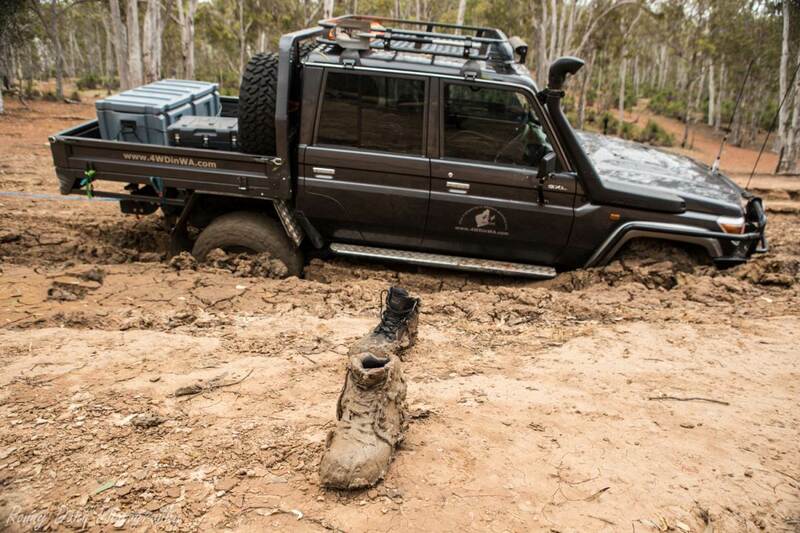 Leave 4x4 Winch And Go 4 Wheeling In Western Australia.